I had been using Windows 8 and TortoiseSVN icons have been displaying properly, but after installing Windows 10 I can no longer see the icons for the files/folder status. 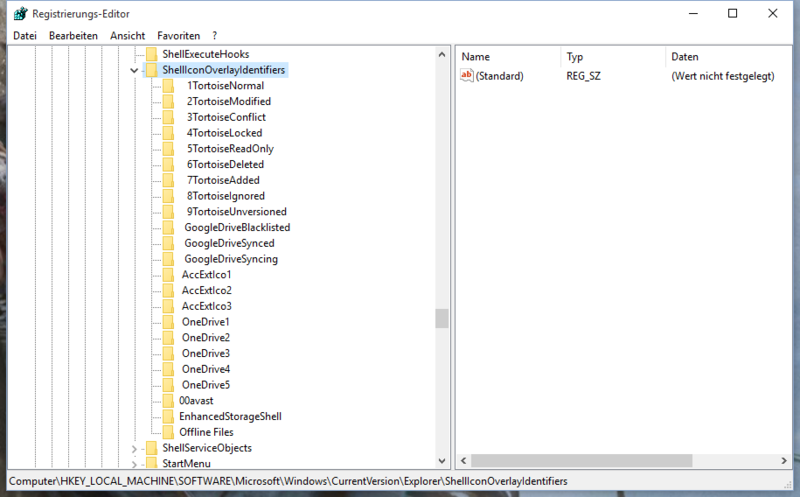 Had same issue, and was solved by running regedit, erasing some entries in HKEY_LOCAL_MACHINE\SOFTWARE\Microsoft\Windows\CurrentVersion\explorer\ShellIconOverlayIdentifiers and restarting. Deleting OneDrive1... enties was not permited, but I had some from Google Drive. You can also make a bakup by double-clicking in the registry directory and doing an "Export" to a file. On Windows 10, most of the entries are used by OneDrive and you won't have permission to remove them. In order to do so, right click on the entry (Example: "OneDrive1", then click "Advanced", then click the link labled "Change" at the very top next to "Owner". This lets you change the owner. Type in your username and hit OK. Now give yourself "Full Control" and then apply it. Now you should be able to delete or rename it. As in current recommended answer mentioned, you need to sort the entries of the overlay identifiers in the registry. I haven't deleted those OneDrive or GoogleDrive entries but renamed all Tortoise Folders by adding 3 spaces to bring them on top. Just restart and even with Tortoise SVN client 1.7.9 you'll see your SVN overlay icons under Windows 10 again. I fixed my problems with TortoiseSVN icons not showing up in Windows 10, for the special case where my repository was on a removable drive. There is a Tortoise setting that determines which Drive Types the icons are used with: Drives A: and B:, Removable drives, Network drives, Fixed drives, CD-ROM, RAM drives, and Unknown drives. It was NOT a problem with the naming of the icon overlays in the Windows Registry. The names were automatically prefixed with "1", "2", etc. to force them (in my computer) alphabetically at the top of the list just before the OneDrive icons. So, all of the icons were within the top 15. 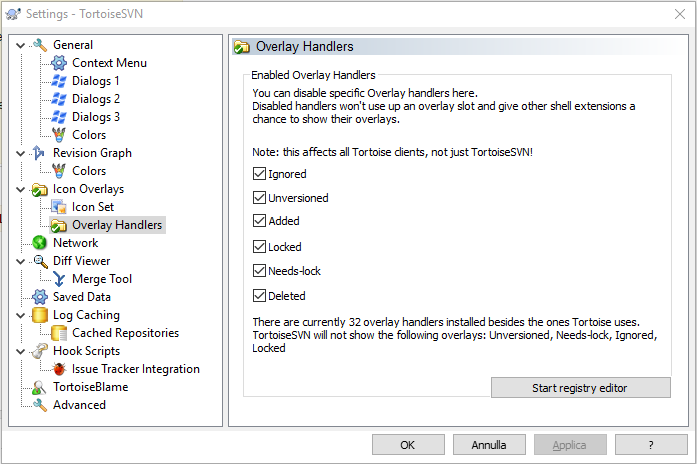 To get to the Tortoise settings, right click on Desktop or a folder and then choose TortoiseSVN > Settings. In Settings, choose Icon Overlays. There'll you find the Drive Types settings. and uncheck all checkboxes, apply, then reactivate them and apply. This will do the same thing in the registry but not manually. Otherwise you can open the registry with the button below, and move up the keys, appending some spaces before the name. 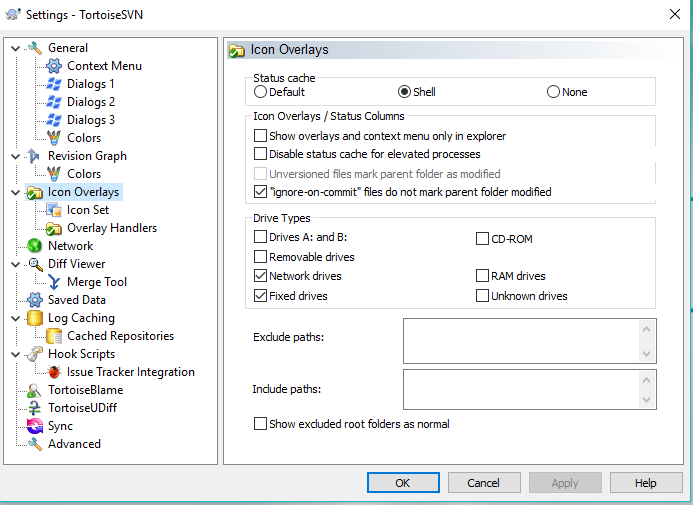 TortoiseSVN 1.9.1 will work around the issue by renaming the Overlay Icons (starting with 2 spaces) to make sure they are loaded before the OneDrive icons. It turned out to be different DPI-scaling on the primary and secondary monitor. When the secondary monitor was set to 125% (same as the primary monitor) the icons appeared again. 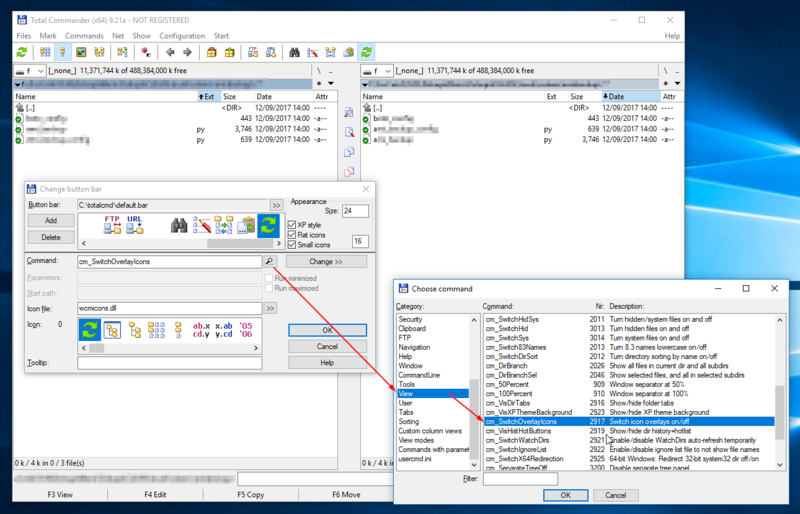 Windows explorer supports at maximum 15 custom overlay icons - they are shared between multiple applications (Google drive, One drive, Tortoise SVN). If you have multiple applications installed - the first ones in list will display their icons, rest of applications won’t. Problem is described deeper in: https://tortoisesvn.net/faq.html#ovlnotall. Rename icons which are not important to you to start from ‘z_’ prefix (will be last in list, will not be used after that). Windows restart might be needed, as just restart explorer does not work. But in my case icons appeared to be correct after some time. (10-20 minutes ?). I would recommend you to change Status cache of the Overlays. Maybe this would help to reinitialise the cache. Be sure touse the latest version of Tortoise. For anyone using Windows 10, there's a request in Feedback Hub to get Microsoft to fix this issue. If you'd like to add a +1 to have it fixed, here's a link: https://aka.ms/Cryalp. The link only works on Windows 10 as it needs to open Feedback Hub to get to the suggestion. The link was generated using the "Share" feature in Feedback Hub and aka.ms is an internal link shortening service used by Microsoft. I had the same problem as OP. Installing version 1.9.2 resolved the issue without any tweak. Now reboot your machine to reflect the chnages. I was using Subversion 1.7.x and installing the version 1.9.1 or modifying the registry entries did not solve this issue of icon overlays. In my case, after using SVN upgrade working copy the icon overlays for the upgraded project appeared. In conclusion, old projects using Subversion 1.7.x do not show icons and projects using Subversion 1.9.x do (under Windows 10). 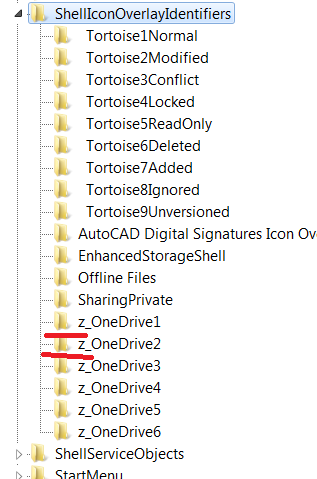 I deleted all my onedrive keys, installed latest preview etc and finally realized that the icons were working all along for some explorer directory views and not others. In other words, medium, large, extra large, and tiles, but not list or detail. Since I don't want to learn all about how that works, I am just viewing my work directories as tiles for now. svn upgrade the working copy. In my case, Jenkins never did a complete fresh checkout and hence the working copy was out of date. As others have indicated, the overlay icon registry area is congested. Here is a powershell script that allows you to dump all the overlays in the registry to a file, then after you edit the file to prioritize your overlays the way you want, you can import them back in and protect them against further modifications from other programs running under SYSTEM. I did all of the above and nothing worked. The overlay icons were appearing in Explorer but not in Total Commander. Eventually what solved the issue for me was that I discovered a command in Total Commander that refreshed the Overlay Icons. To access it, right click on the toolbar and click on "Change...", and add "cm_SwitchOverlayIcons" as shown in the image below. After adding the command icon to the toolbar, I click it once, and the overlay icon of TortoiseSVN appeared! Not the answer you're looking for? Browse other questions tagged tortoisesvn windows-10 or ask your own question. How to integrate WinMerge with TortoiseSvn after installation?